The essence of a self-reliant and autonomous culture is an unshakeable egoism. Puritanism - the haunting fear that someone, somewhere, may be happy. Religion is fundamentally opposed to everything I hold in veneration - courage, clear thinking, honesty, fairness, and, above all, love of the truth. The world always makes the assumption that the exposure of an error is identical with the discovery of truth--that the error and truth are simply opposite. They are nothing of the sort. What the world turns to, when it is cured on one error, is usually simply another error, and maybe one worse than the first one. Every government is a scoundrel. Wars are seldom caused by spontaneous hatreds between people, for peoples in general are too ignorant of one another to have grievances and too indifferent to what goes on beyond their borders to plan conquests. They must be urged to the slaughter by politicians who know how to alarm them. We must repsect the other fellow's religion, but only in the sense and to the extent that we respect his theory that his wife is beautiful and his children are smart. 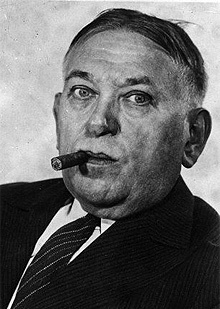 72 quotes by H. L. Mencken.